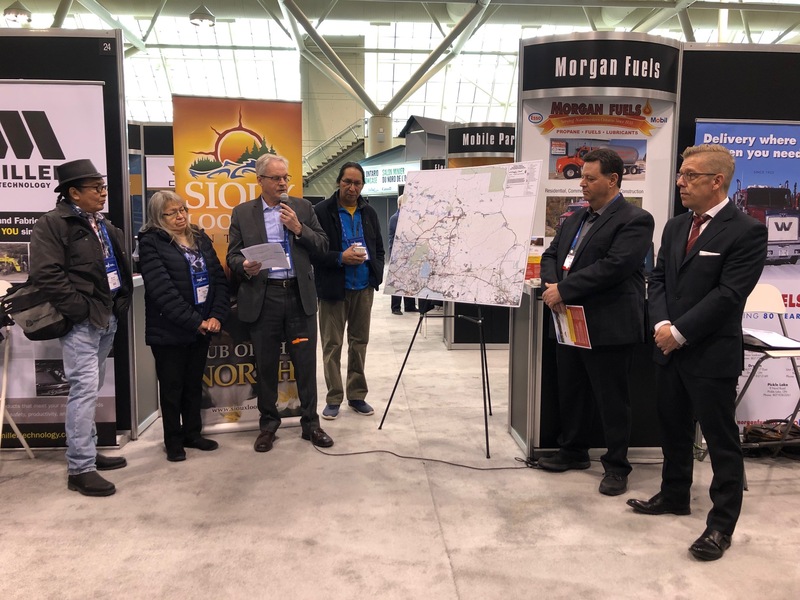 (Toronto, March 5, 2019) - The East-West Ring of Fire Road Coalition (EWRFC) is a new organization at the world’s largest mining conference, the Prospectors and Developers Association of Canada conference (#PDAC2019) advocating for an “East - West road” to access the Ring of Fire. The EWRFC contends this route will benefit the greatest number of Ontario communities, providing all-season road access, increasing the range of economic opportunities associated with the Ring of Fire - a massive deposit of the mineral chromite, with an estimate value of $60 billion. The EWRFC was conceived to represent municipalities, First Nation communities and businesses in Northwestern Ontario supporting the construction of a four-season access road into the Far North. Which will build on the current success of First Nation businesses in Sioux Lookout. The Coalition is seeking government support for a route, which would extend from Hwy’s. 599 & 72 (extending north from the Trans Canada Highway, approx. 250 km west of Thunder Bay) to the Ring of Fire. Originally proposed by mining company Noront Resources Ltd. The East West all-season passes close to Cat Lake, Mishkeegogomang, Lac Seul, Webequie, Nibinamik, Eabamatoong, Saugeen, and Slate Falls First Nations. Other adjacent communities include Sioux Lookout, Pickle Lake, Ignace and Dryden. An electronic version of the map used for illustration purposes at the PDAC media event is available upon request or can be downloaded at this link.